Long-term services and supports (LTSS) enable more than 12 million people to meet their personal care needs and live with dignity and independence in a variety of community and institutional settings. With Medicaid LTSS expenditures of more than $140 billion annually and the aging population projected to grow 18% by 2020, the increasing demand for LTSS is putting more pressure on Medicaid at both the federal and state levels. As a result of these challenges, states are seeking to reform their Medicaid LTSS systems to improve care quality and contain program costs. 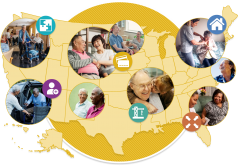 This toolkit, developed by the Center for Health Care Strategies and Manatt Health with support from The SCAN Foundation and the Milbank Memorial Fund, provides a targeted menu of LTSS reform strategies adopted by state innovators that may be replicated by other states. It identifies concrete policy strategies, operational steps, and federal and state authorities that states have used to advance their LTSS reforms. It also highlights opportunities and challenges that states faced in designing and implementing reforms. Other stakeholders, such as federal and state legislators, health plans, and providers, may find the toolkit helpful in identifying opportunities to collaborate with state Medicaid agencies on future LTSS reform efforts.